Curious Louis answers: What happens when an animal at the St. Louis Zoo dies? Curious Louis question-asker Rachel Duncan, left, and St. Louis Public Radio reporter Shahla Farzan, center, speak with Bill Houston of the Saint Louis Zoo. Rachel Duncan doesn’t remember the first time she visted the St. Louis Zoo, but she’s pretty sure she was an infant. Like many St. Louisans, she feels personally connected to the animals at the zoo. That prompted her to ask our Curious Louis reporting series: What happens when an animal passes away at the zoo? Do they have a funeral? And how does it impact the workers? To find out the answer, we took a trip to the St. Louis Zoo to meet Bill Houston, the assistant general curator and director of the Saharan Wildlife Recovery Center. Houston started out as an antelope keeper at the zoo in 1982. Unlike some zoos where staff take care of lots of different species, the keepers at the St. Louis Zoo specialize in certain groups of animals. As a result, they spend years working with the same individuals. Bill Houston, assistant general curator of the St. Louis Zoo, speaks about the relationship zookeepers form with the animals. That close relationship helps the keepers notice subtle changes in an animal’s appearance or behavior that might signal an illness, such as low energy or messy fur. It can also make it especially difficult when an animal dies. For some keepers, it’s like losing a friend. Houston developed an unlikely bond with a babirusa named Homer. The Indonesian wild pig arrived at the zoo in the late 1980s, along with a female babirusa named Grace. 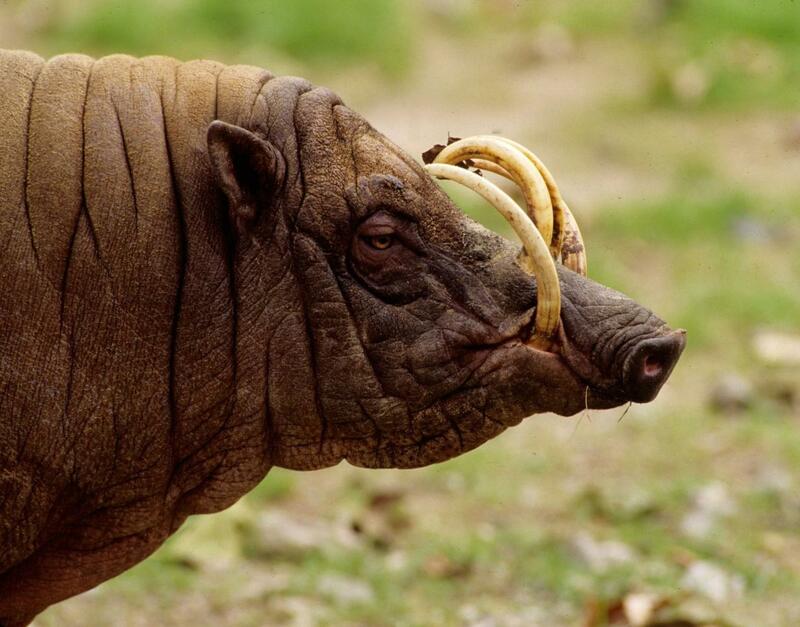 Homer the babirusa arrived at the St. Louis Zoo in the late 1980s. Over time, Homer developed a variety of ailments that come along with old age, including arthritis. Eventually, there came a day when it was time to say goodbye. A staff member stopped by to tell Houston that Homer was scheduled to be euthanized. The zoo doesn’t have funerals, but they make a point to give staff and animals time to grieve. It’s particularly important that highly intelligent, social animals have a chance to process the death, said Houston. When one of their own dies, for instance, elephants and great apes will often gently handle the body and try to lift it. Curious Louis question-asker Rachel Duncan shows reporter Shahla Farzan some of her favorite spots at the Zoo. Once the animals stop returning to investigate the body, keepers will remove it from the enclosure and perform a necropsy, the animal equivalent of an autopsy. Information from the necropsy helps staff rule out any infectious diseases or other underlying medical problems that might affect the rest of the group. Despite the heartache associated with losing a beloved animal, at the end of the day, Houston said the keepers understand that death is an unavoidable part of the job. After talking with Houston, Rachel Duncan says she was surprised that the zoo staff doesn’t have funerals for the animals, but it makes sense to her. “I guess maybe that’s normal, especially now learning that specific individuals only take care of specific animals, that maybe it’s not felt as widespread around the zoo as you might imagine it to be,” she said. She pauses at the polar bear exhibit, where a group of children press their hands to the glass. The bear paddles its dinner plate-sized paws through the water, seemingly oblivious to the crowd. What do you wonder about St. Louis or its people that you would like St. Louis Public Radio to investigate? Ask your question in the form below. (If the form doesn't load, find it here). Ecologist Amy Witt of Forest Park Forever was leading a nature walk through the John F. Kennedy Memorial Forest, a wooded habitat on the park’s southwestern edge. There are trees here that are older than the 1,300-acre park, which the city of St. Louis opened in 1876. Before the Civil War, Bernard Lynch owned the largest slave market in St. Louis. His operation included an office at 104 Locust Street, and a holding pen for slaves at 5th and Myrtle, present-day Broadway and Clark. After the war, Lynch’s slave pen became a storage building for the Meyer Brothers Drug company, and in 1963, it was demolished to build Busch Stadium II. Listener Anne Walker wrote to Curious Louis wondering whether any artifacts from the pen remain. That was the intriguing — and very large — question that Steve Flick submitted to Curious Louis. “We just can't seem to be able to get beyond the Reconstruction Era in this state,” said Flick, a lifelong St. Louisan.